It was once again a beautiful day in a string of days we have been fortunate to enjoy these past few months. My teenage son, who just got his driver’s license this spring, drove me to Scarborough, which is situated along a beautiful stretch of the Maine coastline. I thought Scarborough would be a small town. But in fact it’s quite extensive and, therefore, the gardens were a bit more far flung than I had expected. We forgot to bring our GPS and we spent a lot of time just trying to find the gardens. We saw seven of the ten gardens on display before we decided to head to the beach in Ogunquit and have a rest before our journey home to New Hampshire. These seven gardens were created by the homeowners themselves who demonstrated their creativity, ingenuity, and hard work in creating scenes of beauty throughout their properties. Garden #1 on Winnocks Neck Road called the Webber Linden Garden is situated on a stunning piece of land looking out over a salt marsh leading to the sea. 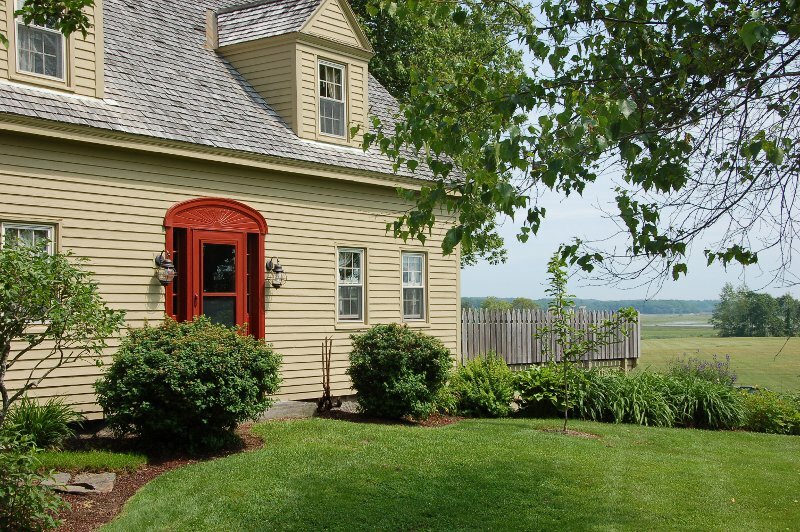 It features a 200 year old farmhouse lovingly restored with additions that complement the architecture. A walk around of the property reveals garden areas that feature perennials such as lilies, blue iris, fragrant peonies, lilacs, and phlox as well as trees including a Chinese Empress with huge leaves and a Black Walnut Ginko Biloba. Scattered throughout the gardens are a wide variety of interesting birdhouses as well as a lovely stone house and gardening shed. 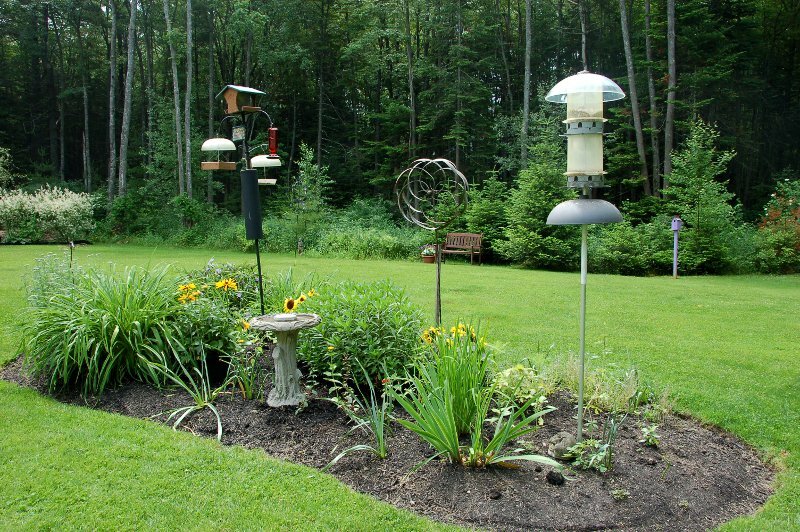 Garden #2 on Bornheimer Place owned by Mary-Jane and George Aube has beds all around the house and the garden has become a sanctuary for many birds including bluebirds, cardinals, finches, eastern phoebes, and woodpeckers. Their two most challenging conditions are the marine clay and wetlands. 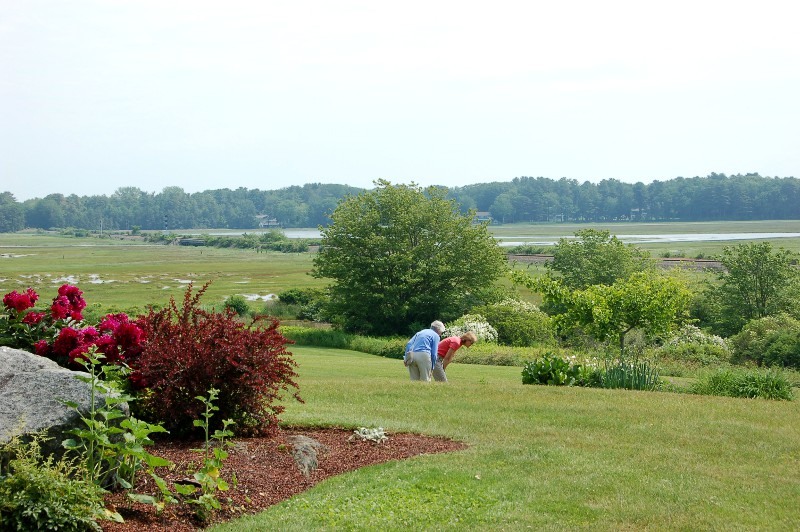 They keep their lawn and gardens free of chemicals to solve various problems. Garden #3 on Frederick Thompson Drive owned by Kay and Russ Doucette designed and created their garden areas that include lilies, coneflowers, irises, phlox, peonies, and various grasses and other perennials. 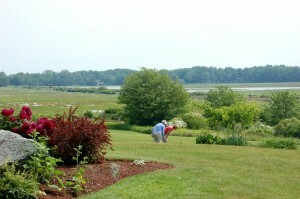 Russ handles the lawn work while Kay takes care of the gardens which also includes a vegetable garden. To keep the color going all summer long, Kay grows a large variety of annuals in her greenhouse. Her favorite plants to grow from seed are Disco Belle hibiscus and Summer Poinsettia amaranthus, which complement each other beautifully. Garden #4 on Ironclad Road owned by Noreen Savage and her husband was twenty years in the making with beds throughout the front and back yards. They have wild blueberry bushes in the backyard along with a corner garden with many hostas, catmint, and astilbe. Noreen’s husband created the small pond with stones, which is surrounded by a variety of perennials and a water fountain. A stone wall surrounds the deck with lavender, hostas, and a corner blue hydrangea. The pool is surrounded by large hostas. The beautiful smoke bush along the side of the garage has grown quite large. 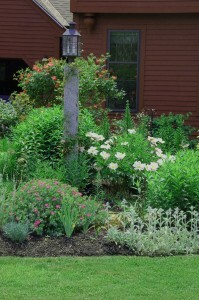 Garden #5 on Old Colony Lane is owned by Nancy Kelleher whose ”working woman’s garden” she created while she had a rather hectic job. Now that she is retired she continues to add to her garden, which focuses on native plants as much as possible and uses no pesticides. Nancy has something blooming from April with Helleborus, Epimedium, Pasque Flower and pansies to late fall with Autumn clematis and hibiscus bush. She recommends that gardeners apply farm composted manure right after spring clean up, followed by dark mulch and strong edging. She keeps plants that have to be deadheaded to a minimum so she has more time to sit back and enjoy her garden with her dog and grandkids. Garden #8 on Maple Avenue owned by Ron and Donna Forest was an amazing experience starting from the road. I walked down a long curving driveway through a lightly wooded area and emerged to see their lovely house nestled in the midst of sunshine that shone through the trees. Every inch of this fabulous property has been meticulously landscaped with a wide variety of trees, bushes, and plants that thrive in the shade including 18 varieties of Japanese Maples. The path around the house is accented by two dramatic gazebos and two potting sheds. As I was leaving, I met Donna Forest who told me the history of her property. They built the house around 1990 when it was solid woods. 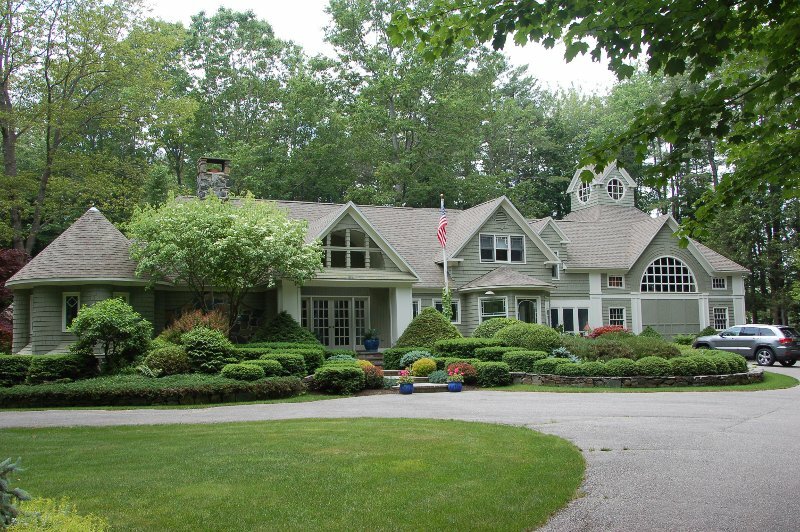 She and her husband have spent the past twenty years selectively clearing the woods and slowly designing and creating the landscaped areas that circle the house and lead to the driveway. Donna, who has no training in landscape design, designed the entire landscape herself, which looks as if was done professionally. While she did read gardening books and consulted local nurseries, it’s evident that Donna has a natural eye for design. I’ve seen enough properties on garden tours over the past several years to appreciate just how special this property is and all the work that went into it. As it is for most gardeners, it’s a work of love with plenty of sweat equity. Garden #7 on Cumberland Way is owned by Richard and Elaine Chase. The landscape in the back of the house features an impressive waterfall area. They cleared the hillside here of 25 tall pine trees. Richard designed and built the 30 foot waterfall that flows into a curving path of rocks leading to the bottom of the hill. 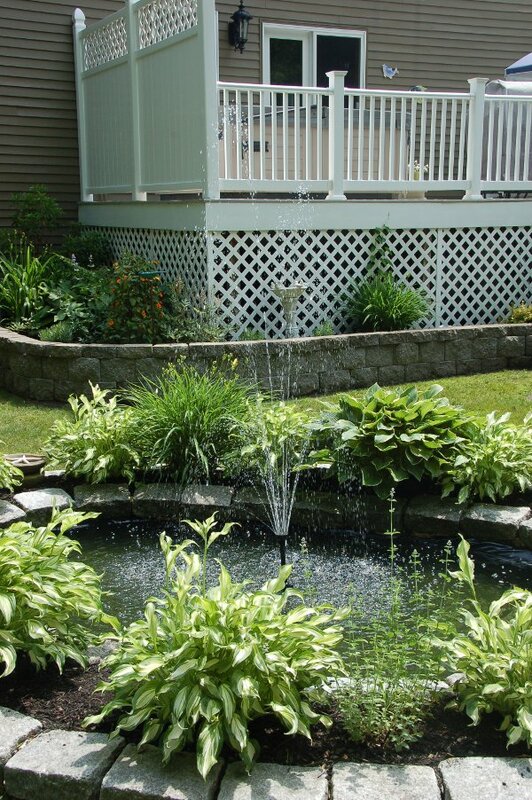 Surrounding this area and along the side of the house, are plantings of hostas, grasses, lilies, iris, coneflowers, daisies and coralbells as well as annuals. 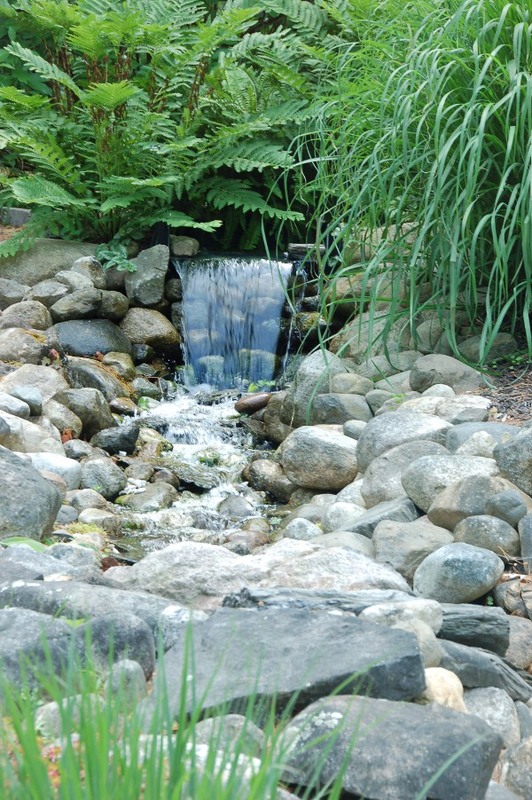 Richard had no previous experience of building waterfalls, but like Donna Forest consulted local nurseries and slowly built this landscape that is not only beautiful but offers a respite from the outside world with the soothing sound of flowing water. 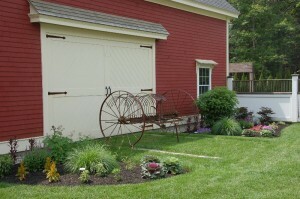 The Scarborough Garden Club did a wonderful job with this garden tour. They had members at each garden alongside the owners to guide visitors and provide background information. They covered every detail including aprons with their garden tour logo for their members, directional signs to guide visitors to each garden, and wristbands as entry tickets, which I haven’t seen before. Scarborough is a community that is into gardening and I am sure each year there is a variety of new gardens to enjoy.